For those who haven’t read the previous posts, let’s recap: Being a prepper involves a certain mindset. You want to understand the physical world around you. That could mean knowing how to repair your roof or it could mean knowing how to dress a deer. It involves believing you have a right to protect and defend your family against the malicious actions of others. It means you understand you can’t save the whole world. That’s not realistic. You focus on protecting your family. Part 6 is something I’ve seen in every prepper I’ve ever known. Preppers have a plan. They have backup plans. They always ask: “What if…?” Preppers are planners. Preppers like options. The don’t like being boxed in. They don’t like being limited. Asking “What if…?” leads you to prepare and plan. * What if your running water became unavailable for a week? What would you do? * What if two violent criminals smashed through your front door? How would you respond? * What if your vehicle broke down while on a deserted road? What course of action would you pursue? * What if social unrest lead to groceries being unavailable in the stores? How would you feed your family? Some plans are simple. More complex plans fail. A famous quote goes something like this: “Plans mean nothing. The process of planning means everything.” As you plan, you confront scenarios. Having thought about those scenarios give you a leg up on people who haven’t given any thought to the issue. Some people mock preppers because of this advanced “What if” thinking. We see this on the Doomsday Preppers TV show. The show asks each featured prepper to tell them one doomsday event they’re prepping for. One prepper preps for economic collapse. Another for a solar flare that knocks out the power grid. A third for a genetic mutation that turns turtles into mutant Ninja killers that seek to destroy the human race. The more extreme scenario the show finds, the more it likes it. Then an expert smugly comes on at the end and tells people the chances of the event happening is one in a billion. The implicit message: Preppers are idiots worrying about exceptionally unlikely events. The media profits from this negative stereotyping. Here’s the thing: These preppers are prepared for a whole host of other possibilities. The guy “worried” about mutant turtles is completely prepared for his power going out because of a winter ice storm. If that guy looks at the short list above, he’s prepared for any of those unpleasant scenarios. If I made a list of twenty bad situations, he’s prepared for them. The only thing he has left to work on his is mutant turtle defense. It’s difficult for the mind of a prepper not to plan and prepare. He wants something to prep for, even if he’s already prepared for nearly anything life can throw at him. Some people just don’t think this way. Some people will hop in their car and drive across a desert without giving the journey a second thought. It usually turns out fine. Not always. Non-Prepper: I’ll call AAA for help. Prepper: What if you can’t get a cell phone signal? Non-Prepper: Ah, I’ll change the tire myself! Prepper: Is your spare tire in the trunk inflated? Non-Prepper: It should be. Why wouldn’t it be? Prepper: Because many spares are very low on air or flat. Do you know how to use your jack? Non-Prepper: Ah, aren’t there instructions on it? Prepper: Have you looked at them? Prepper: OK. Let’s give the benefit of the doubt. You have a good tire. You have a jack. You get your tire repaired. You continue the journey. Wonderful. What if your radiator hose bursts instead of a flat tire? What do you do then? Cell phone still doesn’t work. Non-Prepper: I’d wait for another vehicle! HA! I’d catch a ride with them. Prepper: What if it doesn’t come? Ever. You took a road rarely used. You don’t see another car for three days. Prepper: Do you have water in your car? You do know you’ll be pretty weak in three days, right? Going through “What if” scenarios not only helps you prepare, it helps you make better decisions. After the conversation, the non-prepper could keep a map in his car and stick to the better known roads. He can check his spare tire. He’ll have a better sense of when he’s putting himself in risky situations. He’ll know it’s risky to drive across a desert without keeping some water in the car. 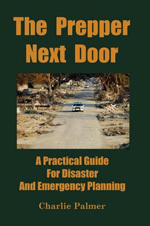 Having been a prepper for over thirty years, I’ve read my share of survival books, survivalist books, and prepper books. Most of what I’ve learned, one way or the other, happened decades ago. I’ve read books on combat, war, wilderness survival, self defense, homesteading, and self sufficiency. I’m pretty much read out of the genera. As they say, there’s no new thing under the sun. Sure, I’ll learn something interesting here or there, but I seldom feel compelled to read a new survival book. The one group of books that still gets my attention are the books which chronicle true stories of survival. These books objectively ask the question: What separates a real life survivor from a non-survivor? The Survivors Club: The Secrets and Science that Could Save Your Life by Ben Sherwood is in this class. Sherwood isn’t a survivalist. He’s a journalist. He approaches the topic objectively and without bias. He has no particular ax to grind or agenda to push. If you’re looking for a book to understand the basic psychology of survival, this is a great choice. If you have extensive military survival training or other survival training, you’ll immediately recognize much of what’s in this book. Some of it will appear common sense. It’s interesting to see how this knowledge plays out for other people in different situations. What are some of the book’s lessons? 1. In disasters, many people don’t panic. They freeze. They suffer brain lock. The way I remember this being portrayed is that when a person is confronted with something completely alien, their brain searches for similar situations to decide how to respond. For most of us, in most disasters, we don’t have experience or a mental script to fall back on. Most people haven’t been in a crashing airplane, a burning building, or attacked by a psychotic with a knife. Our mental search draws a blank and we search the mind again, risking putting us into an infinite mental loop. Some people want to deny the reality of the situation they find themselves in. The book does a great job of discussing this. The corollary to this is that if you know you might confront a particular emergency, it’s best if you have some training. The training will give you a blueprint of how to respond. The blueprint will never exactly match the situation, but it’s a start. Sherwood describes how he, as an author, got access to participate in Navy helicopter crash training. As part of the book, he participates in commercial airplane crash evacuation. 2. Situational awareness is crucial. Situational awareness encompasses many things. It means you appreciate the risks you face. You’re as aware as you can be of the situation you find yourself in. You’re aware of your resources and limitations. An important example Sherwood talks about is a professor who studies “inattentional blindness.” This means we can only visibly focus on a narrow range at one time. To take in more of what’s happening we need to look around and pay attention. As many drivers know, we should constantly be visually scanning for threats. The eyes should be moving. The professor makes it a point to consciously scan a traffic intersection for those nefarious drivers who run red lights and cause many accidents. Sherwood writes about this in the context of accidents and luck. Many accidents can be prevented by extra awareness. You’ll have better “luck” in life if you pay attention. Another good example is counting seats on an airplane and knowing where the exits are. As Sherwood experienced in his crash training, a plane could be filled with thick smoke and you might not be able to see your hand in front of your face. Where is the nearest exit? If you’ve counted seats, you could move seat to seat with your hands as your guide. 3. The role of active passiveness is important. Just because you aren’t active, doesn’t mean you aren’t thinking and formulating a plan of action. You’re mentally scanning for opportunities before you seize on one. I’ll take an example, not from the book, but from the news. The terrorists who bombed the marathon car jacked a guy. When one car jacker went to get gas and the other put down his weapon and started playing with a GPS device, the hostage made his get away. If you’re ever in a situation like this, there is a huge difference between being passive and being actively passive. See, too, the role of situational awareness. You want to take in all the information you can and seize the best opportunity. 4. You need to make good decisions. Sometimes your decision will be made instinctively and other times analytically. Sherwood tells the story of a lady who fell onto a knitting needle that entered her heart. She realized that pulling it out was like taking a cork out of a bottle. She left needle removal to the doctors. This was credited with saving her life. Ironically, the book says famous crocodile hunter Steve Irwin did the exact opposite when he was stung by a bull ray. He ripped out the stinger, possibly severing his atrium, killing him. 5. If you want to live, you need to keep fighting. We won’t all make the right decisions in every emergency and it can kill us. So, too, some situations aren’t survivable. But if you really want to live, you can have much more impact than you might think. In one of the saddest stories in the book, a troubled young man jumps off the Golden Gate Bridge. Deciding he wants to live, on the way down, he makes it a point to right himself so his legs will enter first. On impact, his arms, legs, and much of his body is smashed and he’s forty feet below the surface of the water. Had he landed head first, he would have died instantly. But he can’t swim due to his injuries, and he prays for God to help him. A sea lion nudges him from underneath and gets him to the surface. For those people who like taking online tests, the book ends with a “Survivor Profiler” test you can take online.